My father is 74 and a type 2 diabetic. He has been a type 2 diabetic my entire adult life. My paternal grandmother was a type 2 diabetic who died in her mid 60s due to complications of diabetes. Both my father siblings are/were type 2 diabetics - my uncle passed away a few years ago. As long as I've been old enough to understand what the word "sick" meant, I've been closely related to someone with type 2 diabetes. My greatest memories of my grandmother are of the two of us sneaking into the kitchen, after everyone had gone to bed, and stealing sweets from the refrigerator. As we sat in the dark at the kitchen table, she would make me promise not to tell anyone as we finished all the desserts. She loved to eat and desserts were her weakness. My father is not much better, in fact, when my brothers and I were little, we nicknamed him "The Human Garbage Disposal". My dad has never taken good care of himself, especially not with his diet. In addition to his diabetes, he has a heart condition and has suffered multiple heart attacks over the past decade (one of the heart attacks was while he was riding a hot streak at the casino, he then drove himself from Indiana to Northwestern Hospital - but that's a different blog post). He currently lives with about 7 stents in his veins. Yet, given my father's medical history, he tends to ignore all of the advice given to him by his doctors (and me) and continues to eat whatever he wants and refuses to exercise. So why? Why now, all of a sudden has my father decided that diet is important? Well, recently my father's diabetes escalated to the point where he had to start giving himself insulin shots regularly. You would think that a series of heart attacks would scare the man into taking better care of himself, but no, I believe the insulin is what did it for him. You see, my grandmother died only a short time after having to start on insulin - so I THINK my father's fear of mortality has finally kicked in. Last week, my father phones me up, and with strong conviction he states, "I am now a vegetarian". I sometimes liken my father to an educated, Turkish version of Homer Simpson; therefore, I take his declaration lightly, yet I am completely amused, and I plead with him to continue on with his story. Apparently, my father found a book, written by a doctor, that makes all sorts of claims on how one can lower their sugar levels significantly by following a vegetarian diet. I think it may also be vegan - because there was not any cheese or milk on his shopping list today. My father tells me that it is impossible for him to shop on his own for these items because he has no clue what the majority of the shopping list is/means. He then asks for me to go online, to this doctor's website, and create a shopping list for him. I oblige. Reluctantly. My father pulls out a four page shopping list filled with the most absurd items. (Another sidebar, I was a vegetarian for five years - I didn't eat meat from 16 to 21 - so I am well versed in vegetarian shopping lists). Looking at the list, I chuckle and we start our two-and-a-half hour journey on a SUNDAY afternoon in Whole Foods. 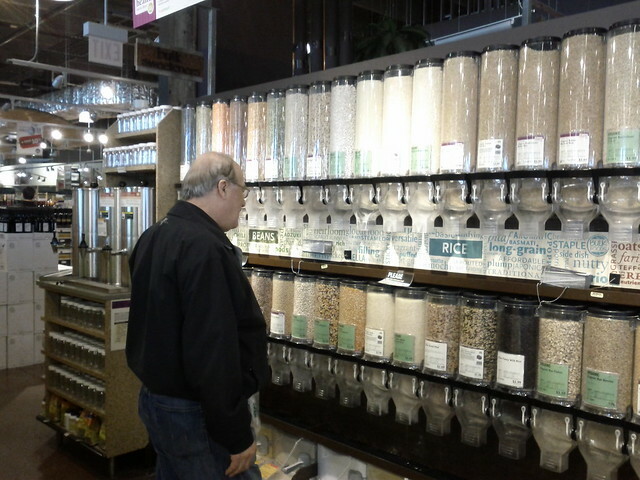 I will start with the bulk aisle - considering we spent at least twenty minutes here. My father had four different types of FLOUR on his list, three different types of oats, two types of barley, two types of rice, along all of the usual suspects any vegetarian would have: dried split peas, lentils, quinoa - and so on...and so on. My father had to make his declaration at least three times to random strangers (and any Whole Foods employees who would stop to listen) that he was NOW a vegetarian. And once, he had to clear up any confusion that the random stranger may have had, by qualifying his statement with - "But, it is not for religious reasons." Just in case, random stranger in Whole Foods might have confused my father for an old man converting to Hinduism or becoming a Sikh. The fun continued as I tried to substitute items on my father's four page list for anything other than what was specifically written down on the piece of paper. My curiosity was piqued when he started to purchase bags and bags of frozen berries. I asked, "Why all the berries dad?" He straightforwardly replies, "I make smoothies." First of all, I had no clue my father KNEW what a smoothie was. My bad, he not only knows what a smoothie is but also knows how to make them. Finally, after we hit the meat substitute aisle and the soy/tofu aisle, we picked up some "white miso" (not really sure what he plans to do with that) and we headed to the frozen foods aisle. This was where my dad felt most comfortable. He started to load up his cart with pre-made, frozen vegetarian dinners. He fancied a particular Mushroom Barley soup and asked that I throw about four of them in his cart. I thought it was a bit excessive and he said, "But it is much easier for me this way." He then went onto tell me, "Forget one hour to cook all this stuff, the other day, it took me one hour just to READ the recipe. "The image of my dad sitting at his dining room table trying to understand what the difference between rolled oats, thick cut oats and instant oats were was something I found comical. Once our 2.5 hour journey was over and we were heading home, my dad asked if he could take his groceries up before dropping me off at my apartment (we live two blocks away from each other). I said, "Sure." We take his bags upstairs and he drives me home and as I am getting out of the car he says, "Thanks Lulu (he calls me Lulu)....I hope you find a husband!" Totally not related, totally not necessary and yet he is always consistent with throwing the husband thing in there at any given opportunity, even if it is not an opportunity, he makes it one! Love when you write/tweet about your mom and dad. I feel like I'm following a beloved tv show about a loving and quirky family. A side note: my father-in-law, who suffered from diabetes his whole adult life, decided to tackle his escalating weight with Weight Watchers. In one year, he lost over 100 lbs and quite unexpectedly, lost all symptoms of diabetes. Your father doesn't have a weight issue but in case he misses meat in his new vegan diet, he may consider other modified diets. I loved this post...you and your Dad have such a sweet relationship. You are both lucky. I can't wait to hear how your Dad's vegetarian adventure turns out...keep us posted! I recommend the slow carb diet as described in the "The Four Hour Body" by Tim Ferris. A vegetarian diet is going still going to have a lot of sugar but a heavy protein diet would likely do more to keep his insulin levels from spiking. I wish his luck either way. Jason, I totally agree but he is convinced this is best. In the week he has been on an all vegetarian diet, his sugar levels have decreased significantly. I dont agree with all the carbs in this diet...but do far it's working for him. This cracks me up and sounds like my grandparents....the talking to strangers bit especially. I'm rooting for your dad and hope he sticks with this new diet! Great post Leyla! How funny that your father threatened to block you on Facebook! Luckily my dad doesn't even own a computer! Great storytelling...I wish your father luck!